Astronomers are watching the astronomical equivalent of an instant replay of a spectacular outburst from the unstable, behemoth double-star system Eta Carinae, which was initially seen on Earth nearly 170 years ago. Astrophysicists affiliated with UC Santa Barbara and Las Cumbres Observatory Global Telescope Network (LCOGT) contributed to the study. Dubbed the “Great Eruption,” the outburst lasted from 1837 to 1858 and temporarily made Eta Carinae the second brightest star in the sky. But luckily for today’s astronomers, some of the light from the eruption took an indirect path to Earth and is just arriving now. The wayward light was heading in a different direction, away from our planet, when it bounced off dust lingering far from the turbulent stars and was rerouted to Earth, an effect called a “light echo.” Because of its longer path, the light reached Earth 170 years later than the light that arrived directly. The team’s paper will appear Feb. 16, in a letter to the journal Nature. Armin Rest of the Space Telescope Science Institute in Baltimore, Md., initially discovered the light echoes, and was the leader of the study. The observations are providing new insight into the behavior of powerful massive stars on the brink of detonation. Very massive stars, especially a pair of them, are exceedingly rare, and little is known about how they lose mass as they die. The views of the nearby erupting star revealed some unexpected results, which will force astronomers to modify physical models of the outburst. Located 8,000 light-years from Earth, Eta Carinae is one of the largest and brightest star systems in our Milky Way galaxy. Although the chaotic duo is known for its petulant outbursts, the Great Eruption was the biggest ever observed. 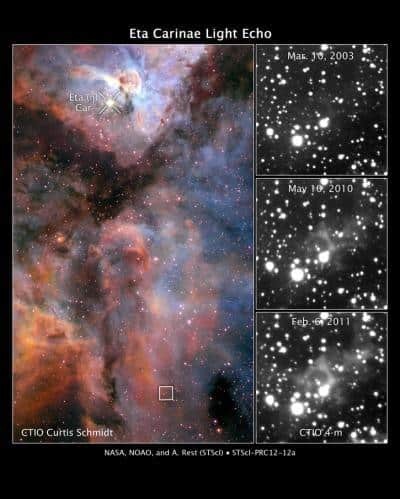 During the 20-year episode, Eta Carinae shed some 20 solar masses. Some of the outflow formed the system’s twin giant lobes. Before the epic event, the stellar pair was 140 times heftier than our Sun. The team’s study involved a mix of visible-light and spectroscopic observations from ground-based telescopes. These observations mark the first time astronomers have used spectroscopy to analyze a light echo from a star undergoing powerful recurring eruptions, though they have measured this unique phenomenon around exploding stars called supernovae. Spectroscopy captures a star’s “fingerprints,” providing details about its behavior, including the temperature and speed of the ejected material. The replay is giving astronomers a unique look at the outburst, and turning up some surprises. The turbulent star does not behave like other stars of its class. Eta Carinae is a member of a stellar class called Luminous Blue Variables –– large, extremely bright stars that are prone to periodic outbursts. The team first spotted the light echo while comparing visible-light observations they took of the star in 2010 and 2011 with the U.S. National Optical Astronomy Observatory’s Blanco 4-meter telescope at the Cerro Tololo Inter-American Observatory (CTIO) in Chile. They obtained another set of CTIO observations taken in 2003 by astronomer Nathan Smith of the University of Arizona in Tucson, which helped them piece together the whole 20-year outburst.